If you are a regular Windows Live user, then this one is for you. Windows Live brings to you some really amazing and exclusive downloads such as free wallpapers, Desktop screensavers, wallpapers and messenger theme packs. Two or Three freebies are released each month and are archived the very next month. So even if you miss a Windows Live freebie download for the current month, you can always get it from the archive. Head over to the Windows Live Freebie Corner. You will find out all new downloads that jazz up your Windows Live experience. Currently there are 8 downloads available on the portal and will increase with months to come. Remember, you get new free downloads with every new month. The older downloads are sent to the archive. 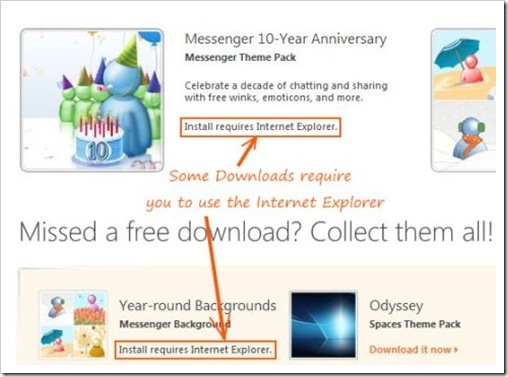 Most of the downloads require you to be using the Microsoft Internet Explorer. One very unique download is the seasonal signatures for Hotmail which lets you choose your signature according to the current season.